Etsy is taking its TV commercial national - which may give sellers hope for a more prosperous holiday selling season (you tell us!). "On Nov 8, Etsy will roll out a national US TV ad featuring customer testimonials with individuals discussing their shopping journey through Etsy's differentiated experience. This national ad buy comes on the heels of local tests that Etsy recently ran using several creative concepts. "We believe the testimonials tested the best due to the emotional, human element and the fact that they featured a wider range of products. "The testimonials ran in Seattle, Minneapolis, and Baltimore. Brand awareness, visits, and purchase intent performed better in these three cities compared to their respective control markets." During the holiday shopping season, Etsy is making available curated gift guides, personalized recommendations, and an easier way to have items customized. That may feel like a big win for sellers who want shoppers to understand many items are crafted by artisans. "Etsy has added a new feature on listing pages so that buyers can more effectively communicate item personalization requests to sellers. We believe this feature will be a valued addition for many Etsy buyers, and make it easier for sellers to deliver exactly what their buyers want." Etsy is also emphasizing free shipping. 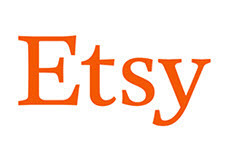 "Millions of items now ship for free on Etsy. We are continuing to educate sellers on the importance of fair and competitive shipping. We are also making shipping times and estimated delivery dates clearer on our site, so that buyers can be confident that items will arrive in time for the holidays." That's a double edged sword - the approach that makes some sellers uncomfortable since there's no such thing as free shipping and some fear it makes Etsy look more like commodity sites. On the other hand, some might say attracting shoppers is the name of the game during the final 2 months of holiday shopping. - Etsy will run ads on NYC subways on 575 subway cars for four weeks. - On Small Business Saturday, Etsy sellers will host pop-up markets in San Francisco, Austin, D.C., and Boston, to provide destinations to shop locally crafted, one-of-a-kind items this holiday season. - Brit & Co Shopping Destination: Brit + Co is hosting a curated that features over 1,000 handpicked items from Etsy. "Using an innovative shopping tool created by Brit.co, shoppers will discover the best one-of-a kind items created by Etsy's community of 2 million entrepreneurs." An Etsy spokesperson told us the overall takeaway is as follows: "Etsy is working to bring magic to more buyers this holiday season. We are launching new marketing campaigns to remind shoppers that we are the best destination for unique and thoughtful holiday gifts." More buyers is a worthy goal - let us know what you think of the TV commercial and Etsy's overall approach. Are you hopeful of having a successful holiday shopping season? This is GREAT news! I have been hoping that they would do something like this for ages. I especially like the subway ads. That being said, because the search function is so broken, who knows if all those new customers will be able to find what they're looking for. Meanwhile Fleabag gives deals to one select seller a day. How nice. Well we are off to Amazon where we find things to buy without a problem. Oh and Ebay ya all can keep your 10 percent ebay bucks offer. Not wasting a minute of our time looking for something hidden in the weeds to buy. If they can keep this up on a twice a week basis after the holiday season and into the New Year 'til June, I predict strong sales. Choose the time slots wisely. Over a BILLION dollars in sales is at stake. more brainwashing on the free shipping BS. look anywhere online at the shipping companies and all the venues sending out notifications of shipping cost increases every few months. there is no such thing as free shipping for anyone. of course , the sellers are blamed for too high of prices because they add the shipping cost into the price of their product. then if the sellers are honest about the shipping , the fat cat thieves want to steel a FVF on the shipping they claim is free , and hide the listings of the poor sellers. where do they dig these liars up?? Believe me, I have been one of Etsy's harshest critics, but when they do the right thing, you have to give them credit. The New York market where they have their HQ and where these "on the ground" ads are being run, is one of the biggest most lucrative in the world. Literally millions of people walking around NYC are going to see these ads, plus the ones on TV. I AM THRILLED. We need all the help we can get. Every day it seems to get harder and harder to sell anything online. Nice commercials, Etsy! I hope to see one on our big screen soon! One question though: what about vintage??? MADE IN AMERICA on Etsy. Advertised as such, will start the flood of orders. Items have to be Good USEFUL Unique Collectible items like mine. TV ADS. TV ADS. TV ADS. TV ADS. TV ADS. TV ADS. RADIO ADS. RADIO ADS. RADIO ADS. RADIO ADS. @TheEnd - DEFINITELY push the Made in USA (in the USA commercials!) Don't forget Lifetime and A&E!